Are Tariffs a Black Swan? Some markets like stocks and currencies are treating the tariffs as rather binary events to be immediately bought or sold en masse, other markets like soybeans and metals seem to be letting it create a new market environment with different long-term price levels. Ironically, the popularity of these products significantly increased the probability of their own demise. These products, and others like them, provided a simple vehicle for betting against volatility. Managed futures, commodity trading, forex trading, and other alternative investments are complex and carry a risk of substantial losses. As such, they are not suitable for all investors. You should not rely on any of the information as a substitute for the exercise of your own skill and judgment in making such a decision on the appropriateness of such investments. The entries on this blog are intended to further subscribers understanding, education, and – at times – enjoyment of the world of alternative investments. Unless distinctly noted otherwise, the data and graphs included herein are intended to be mere examples and exhibits of the topic discussed, are for educational and illustrative purposes only, and do not represent trading in actual accounts. Opinions expressed are that of the author. The mention of specific asset class performance (i.e. +3.2%, -4.6%) is based on the noted source index (i.e. Newedge CTA Index, S&amp;P 500 Index, etc. ), and investors should take care to understand that any index performance is for the constituents of that index only, and does not represent the entire universe of possible investments within that asset class. And further, that there can be limitations and biases to indices such as survivorship, self reporting, and instant history. The performance data for various Commodity Trading Advisor (“CTA”) and Commodity Pools are compiled from various sources, including Barclay Hedge, RCM’s own estimates of performance based on account managed by advisors on its books, and reports directly from the advisors. These performance figures should not be relied on independent of the individual advisor’s disclosure document, which has important information regarding the method of calculation used, whether or not the performance includes proprietary results, and other important footnotes on the advisor’s track record. The mention of general asset class performance (i.e. 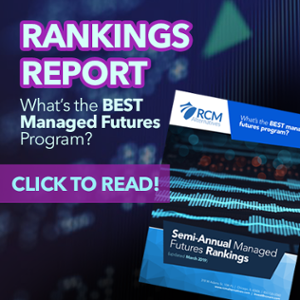 managed futures did well, stocks were down, bonds were up) is based on RCM’s direct experience in those asset classes, estimates of performance of dozens of CTAs followed by RCM, and averaging of various indices designed to track said asset classes. The mention of market based performance (i.e. Corn was up 5% today) reflects all available information as of the time and date of the publication. The owner of this blog, RCM Alternatives, may receive various forms of compensation from certain investment managers highlighted and/or mentioned within the blog, including but not limited to retaining: a portion of trade commissions, a portion of the fees charged to investors by the investment managers, a portion of the fees for operating a fund for the investment managers via affiliate Attain Portfolio Advisors, or via direct payment for marketing services.